Block Mania – Mobs, Kelggs, and Fatties… Oh My! When James texted me a couple of nights ago and asked me if I wanted to have a game night, my answer was a simple, “always!” When he asked me what I wanted to play, I decided to suggest a game that we haven’t played in a LONG time. 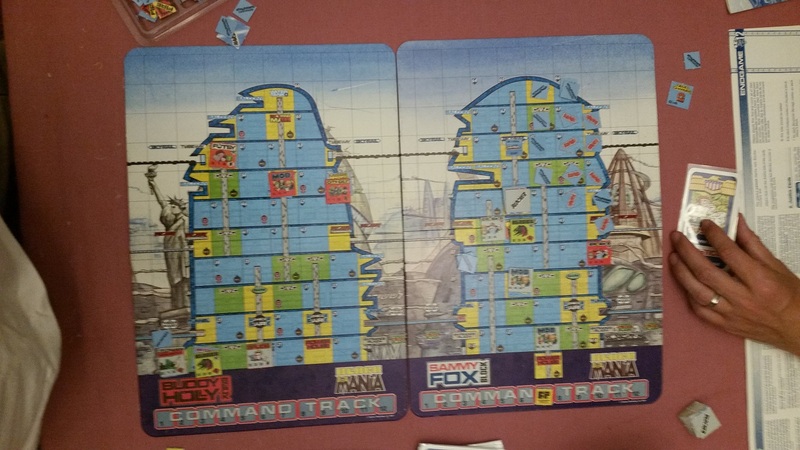 I suggested the 1987 Games Workshop boardgame, Block Mania. 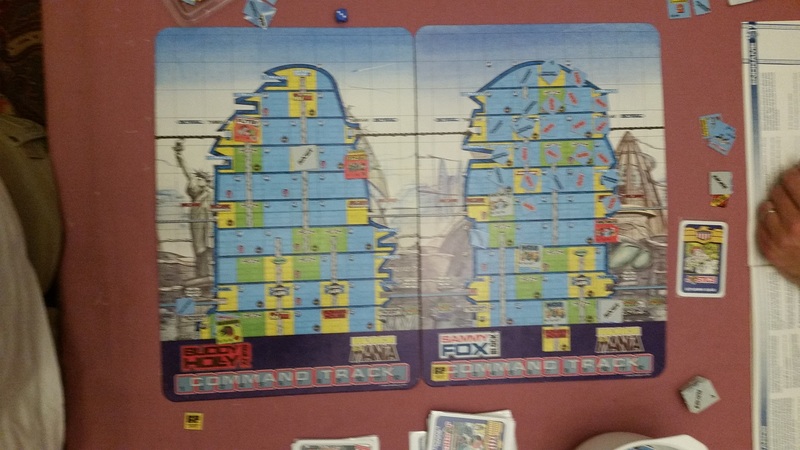 As the box says in the lower left hand corner, Block Mania is, “a 2000 AD Judge Dredd Boardgame.” Block Mania is a skirmish game between rival housing blocks of Mega-City 1, fighting to destroy their neighbor’s block. If you’ve ever read the old Judge Dread comics or if you have suffered through the Stallone movie, then it all sounds pretty familiar. In the future people are crowded into super tall Mega Blocks. Each block is chocked full off all the necessary amenities to entertain and feed the population. Unfortunately, the under employed and bored residents will strike out against their neighbors over the slightest provocations. Now, when I say it has been a long time since we played Block Mania, I mean it has probably been around 15 years. I currently own the game but this copy has been floating around our gaming group occasionally changing hands since the last time we played it. The game is complete, and I even have the Mega Mania expansion that allows for four players to play at once instead of the default two players in the main box. The boards are cut away views of the inside blocks and the boards actually wrap around, so if you were to move off the far edge of the boards you would reappear on the opposite edge. The internal blocks are broken up into normal sections, special sections, and civic sections. Civic sections are considered to have escalators and moving walkways so they speed up movement but they are also considered ‘open air’ and don’t offer much in the way of cover. The special sections include balconies (which enable you to shoot from or take flight), Power Plants (keep the lights and walkways on), the Armory (were residents stock up on firepower), Mall (were residents stock up on hardware), water tank (which keeps the sprinklers working), and the two stations for the Megaway (highway) and the Sky Rail (train station). The game is chocked full of rules and various ways to score victory points. Looting your opponents sections or tagging their civic spaces with graffiti will score that player with defeat points. The player with the fewest points at the end is the winner. Having your entire block collapse gives you 200 points and in our experience that seems to be the usual outcome. Having your block collapse dose not eliminate you from the game, but you are only limited to what you have left on the board and you are unable to bring in any reinforcements. Our first game was just to get the feel of the rules. We made lots of mistakes that we corrected as we went, and the game took a while as we had to refer to the rule book OFTEN. I took some pictures as the game progressed, but several of them are not really in focus, so… my bad. To start the game, we each draw and deploy four Blockers (various residents from our Blocks) from our piles, and three cards. The cards add lots of elements to the game ranging from additional Blockers that can be deployed for free, to bonuses in combat, to adding Skyrail cars to the Skyrail system. The point of the game is to collapse sections of your opponents Block, forcing them to roll five six-sided dice until their dice total is less than the number of collapsed sections of the Block. If your roll is less than the number of collapsed sections, your Block collapses and you lose the game. The first couple of rounds were pretty even, until James played his first Kleggs card. Kleggs are mercenaries that are cheap to move, and tough in combat. Whoever played the last Kleggs card gets to control all the Kleggs on the board, so if you rely upon the Kleggs, your fortunes can change pretty quickly. They can’t start fires or attack sections to cause damage, but they can shred your rival Blockers VERY quickly. Only two Kleggs can be in play at any one time. We missed that rule, so our first game had WAY too many Kleggs on the board. Fire can spread and cause structural damage. One lowly fire can turn into a blaze in the matter of a few turns. About halfway through our first game, I was lucky enough to draw a card that allowed me to start a fire in any section of my choice. It was also lucky for me that James was so busy slaughtering my Blockers that he did not leave anyone in his Block to put out the fire that I caused in his Power House. The fire quickly collapsed any access to the get into the Power House to extinguish the fire which meant that it had the possibility of spreading every turn. In the meantime, James was able to start a few fires in my Block, but I got lucky with some rolls and only lost a few sections, and the resulting collapses managed to put out the fires. It was about this point that I managed to finally draw a Klegg card of my own and I took control of a sizable Klegg army. Did I mention that we had too many Kleggs in play for most of the game? I ran the Kleggs back into James’ Block to cause some trouble while I sent in a Blocker armed with demo charges. The demo charges successfully caused a fairly significant amount of damage due to some unlucky rolls from James, and effectively cut his Block in half at an angle. Soon after the demo charges did their work, I was able to run some Crocs (Block Mania’s version of senior citizen gangers) across the Pedoway halfway up the board and set a fire in a relatively undefended section of James’ Block. The Crocs did not survive the fire they started, but luckily for me, neither did James’ Block. It was after the collapse of several more sections due to the fire that James finally failed his 5D6 roll, and his entire Block collapsed. After a quick discussion about a few rules we got wrong, we decided to reset and play another game. Both James and I got lucky and immediately drew Blockers armed with missile launchers. Missile launchers are game changers that can cause LARGE amounts of damage with each shot. They are heavy weapons which take an extra turn to deploy once you get in position, but once they are deployed, your opponent should consider being somewhere else. I also lucked out and drew a second Blocker armed with demo charges. James got to take first turn and he immediately ran his missile launcher equiped Fatties to the Armoury to grab more weapons. I think this ended up being a game ending misstep on his part. I immediately moved my missile launcher equiped City-Defense Blocker to a window and deployed my missile launcher. I also immediately managed to deploy Kleggs to cause havok in James’ Block. I also ran my Crocs into the side of James’ Block and had them detonate their demo charges. Thanks to some particularly unlucky damage rolls for James, the demo charges managed to collapse eight sections in a single shot. My Kleggs also got into range of James’ Fatties and prepared to open up with a flame thrower. In the fourth and final turn of game two, I managed to do only a small amount of damage to the side of James’ Block with my missile launcher, but my Kleggs managed to not only kill James’ Fatties, but they also started a fire that immediately caused a collapse chain reaction. At this point, James immediately failed his Block collapse roll and our second game was over in record time. The Mega Mania expansion is a must! In summary, we had a fun night, as well as a few laughs. Block Mania is a cool, fun, early Games Workshop game filled with LOTS of game pieces, as well as lots of game imbalance. Advantage in the game swings wildly from turn to turn, and there are large amounts of silliness and unpredictability. The fluff and atmosphere of the game are entertaining, and if you are a fan of Necromunda, Block Mania is a cool game to have as an option in your collection. This entry was posted in Gaming, Necromunda and tagged 2000 A.D., Block Mania, board games, boardgames, Fatties, Games Workshop, gaming, Judge Dredd, Juves, Kelggs, Mega Mania, Mob, Spugs, table-top games by Mike C. Bookmark the permalink. Never seen that game before. Nor have I read any of the comics. I did watch both Dredd movies though. The second wasn’t bad, and I kept hoping they would make a sequel. Anyways, game! Yes, it looks pretty interesting. How long is the average game time? I always like to find a decent two-player to play with our teen sometimes, and it sounds like it could be a fun one. Game time average can vary depending on your familiarity with the rules. The game has a set number of rounds by using the deck of cards. At the start of the game sixteen cards are put aside and every player turn a card is drawn. When the deck is exhausted you turn to the 16 remaining cards. The cards are double-sided with one side being used during the game and the back side which are Judge cards used in the last rounds. When you draw the judge the card it is played and its affects calm down the carnage (arrest blocker counters, put out fires, etc.). Of course we didn’t play long enough to get to those cards but if you know what you are doing probably 2 hours would be a good bet. Maybe more with the Mega Mania expansion. James, even in our first game, we still had a LOT of cards left in the deck at the end. 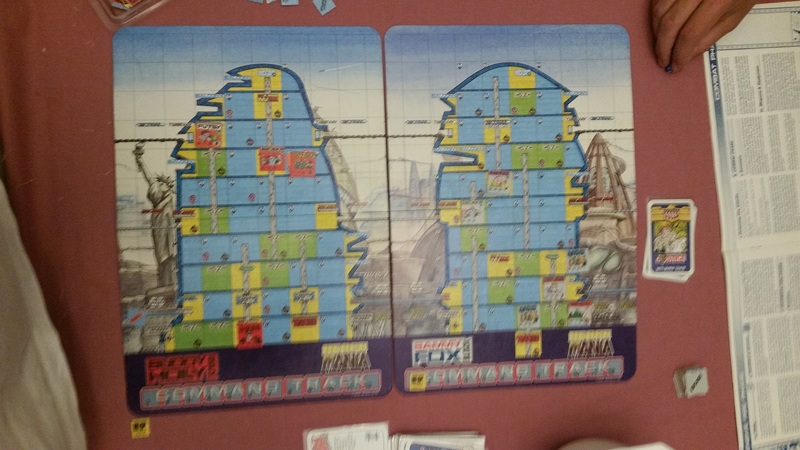 It has been a long time since we played, and I didn’t read the rules ahead of time… Did Mega Mania! come with its own cards? Is it possible that we had too many cards in the deck we were using? I did some searches and the base game should be 54 cards I believe. How many do you have? Looks like we were playing with the correct amount of cards then.